To be honest there are hundreds of videos of the simplified form (24 step form). Lots of schools and masters produce their own versions - a quick look through Amazon and a look at the customer reviews should find you something that you like. We hope you find something you like in our selection. We know people who have learned from the original video and we've watched it. Clear instructions and we're a big fan of Dr Lam (Rosie has been lucky enough to take several workshops with him!). Available in multiple formats and in several languages. Professor Li Deyin in charge. There are step-by-step instructions and demonstration with front and back views of the form demonstrated by Su Renfeng. The music is 'Tai Chi Melody'. Although we haven't seen this version Prof Li Deyin was one of the creators of the 42 step competition form and our teacher, Mike, took several workshops with him and he liked him - and that's good enough for us. This teaches the standard 24 movements posture-by-posture with repetition and explanation by Master Tsao in English. The entire routine is demonstrated in both front and back views. click here for demo and free lesson - opens on Master Tsao's site. Clear instruction style. In the Tai Chi for Life series, Master Guangzhi Xing teaches you to combine balance, coordination and breathing with harmonious movements as a way to renew and invigorate your body, mind and spirit. Yang style is known for its smooth, harmonious movements which create a wavelike appearance in motion. 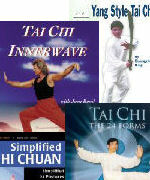 On this DVD, Master Xing teaches you the Simplified Tai Chi 24 Form and the Tai Chi Sword 32 Form. Master Xing demonstrates from the front, rear and side views, performing the complete form then teaching the individual movements one by one with detailed instruction. The ones we used to have have all been discontinued as production changes over to DVD. We're having trouble finding English versions - but have found some Chinese with English sub titles on Ebay - have a look at our auction pages.